City after city, Muslim murderers lurk in the shadows, waiting for the call from Allah to strike. “Allahu Akbar” is today’s “Geronimo.” The call for violence from the Islamic devil triggers the anger within. Devastation and blood, their calling card. And as day follows night Jihad follows serenity. This Champs Elysees was the venue. The killer had spoken about wanting to kill police but had had no apparent link to Islamist radicalism before the attack, prosecutors said. A note defending so-called Islamic State (IS) was found near his body. 13 Jun 2016 -A knife-wielding jihadist kills a police officer and his partner at their home in Magnanville, west of Paris. He declares allegiance to IS, and police later kill him. 20 Apr 2017 – A convicted criminal who was investigated for threatening to kill police opens fire at police on the Champs Elysees in Paris, killing one and wounding two. He is shot dead – and the assault is claimed by IS. 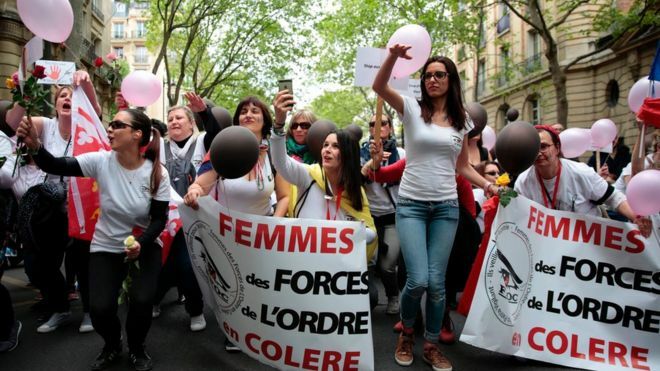 More than 100 wives and partners of police have protested in Paris against attacks on police following the killing of an officer on the Champs Elysees.